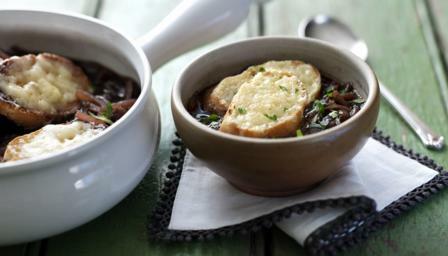 Packed with the best exports - brandy, red wine, garlic, butter and cheese - James Martin's easy recipe for French onion soup redefines luxury. Peel and thinly slice the onions and garlic. Then using the butter sauté in a large pan for 15-20 minutes, until brown. Stir well before adding the red wine, stock, vinegar and brandy. Bring to the boil and simmer for about 10 minutes. Toast the bread and top with the grated cheese and place under the grill until the cheese is melted. Keeping the soup in the pan, top with the sliced bread and a sprinkle of cheese. Place under the grill until it turns brown and the cheese has melted. Scatter with fresh chopped parsley and serve from the pan at the table.